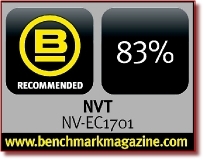 Winning a recent Benchmark magazine shootout versus Ethernet over Coax transceivers from a variety of other manufacturers, Network Video Technologies’ NV-EC1701 EoC device scored a triumphant 83% overall rating. The UK’s only security publication dedicated to establishing a performance index for electronic security products, Benchmark magazine awarded NVT’s EoC transceiver with its ‘Recommended’ status, and a group test winning 88% performance rating. Delivering Ethernet and Power-over-Ethernet up to 750m over new or existing coax cable, each NVT EoC transceiver can distribute PoE to up to 4 remote transceivers, and their associated IP/Megapixel/PoE cameras. Simple to install, the NVT EC-1701 forms the basis of NVT’s growing range of Ethernet and Power delivery products. The unit provides an alternative solution for end-users looking to economically upgrade to IP, Megapixel or High Definition CCTV surveillance, using their existing coax cable infrastructure.